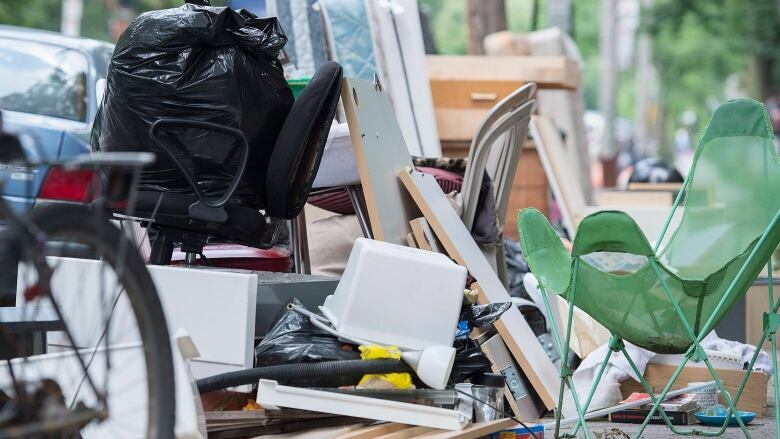 The city of Montreal is planning to eliminate twice a week garbage pickup and move to once a week in all 19 boroughs by 2019. Currently, ten boroughs have trash collected twice a week, while nine boroughs have it picked up once a week. Réal Ménard, the city's executive committee member responsible for the environment, said Monday he wants the same standard across the city. "Boroughs that currently have two pickups a week of garbage will see one of those pickups replaced by a compost pickup using brown bins," Ménard said, referring to the bins that are currently used by 100,000 households in various neighbourhoods around the island. The city will invest in 500,000 new brown bins to be distributed to households starting next year so that every borough has one garbage pickup and one compost pickup each week. Sylvain Ouellet, a councillor for the opposition Projet Montreal, said his party supports the idea, with some reservations. "In certain neighbourhoods people don't have balconies or garages to store their garbage, so there could be problems with odour and vermin, particularly in the summer" said Oullet. He suggested the city consider maintaining twice a week garbage collection in some neighbourhoods during the summertime, or adding exceptional pickups during heat waves. Ménard said the city will release more details about its plan next month.